Dang It Delicious: Dignified, delicious nibbles. Mushrooms with a glass of Red. Dignified, delicious nibbles. 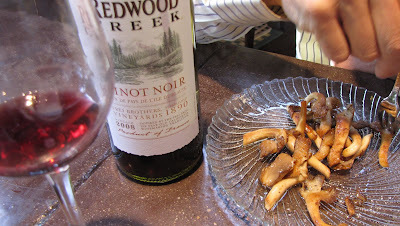 Mushrooms with a glass of Red. Sometimes you want a dignified delicious snack between lunch and dinner - fast and not expensive, but elegant and tasty. The most popular quick-with-little-effort, BIG results dish is flash seared mushrooms. Serve this with a glass of Redwood Creek Pinot Noir. Total time is less than 5 minutes! Get some fresh mushrooms, of any variety. I prefer trumpet, shitake, oyster or some pretty no-name shrooms (photo below). Heat pan on High. Generously coat the pan with olive oil. Still on High Heat, add the mushrooms.When they start to brown, use a spatula (or wooden chopsticks) to turn some mushrooms over so they evenly sear. Add sea salt and fresh pepper to taste. Serve immediately with a glass of your favorite red. 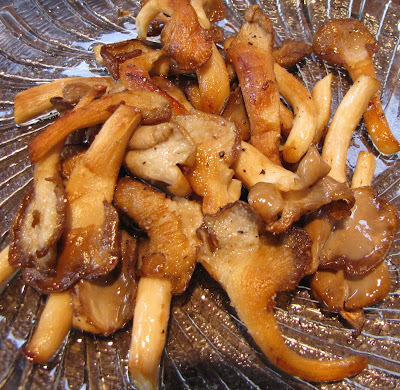 Sprinkle salt and fresh pepper, and these mushrooms BURST with outrageous flavor. Simple is best. It's all about the mushrooms, but you can turn it into something completely different....by topping it off with some aged cheese chunks, sprinkle sesame seeds, or garnish with scallion. Versatile. This Redwood Creek Pinot Noir has tremendous value, going down smooth and flavorful, at under $10 dollars a bottle. (Cheap is nothing to be embarrassed about!) Enjoy.